I’ve gotten spoiled by modern US armor being one color lately. A three color scheme like this a lot of work (about 6 hours last night) …. but the result is worth it. In this photo I have just finished putting on the three colors and now I’m ready to paint the tracks and do some weathering and a wash.
Getting the colors mixed just right was a challenge. The green was not too bad, it’s 75% Olive Drab and 25% Dark Green. The tan color was a problem. The documentation I found says the tan is FS30219. Testors Model Master Acryl makes an FS30219 but after spraying all the units with that color I found it to WAY too brown/red for my liking. So added tan and sand until I got a color that more closely matched what I was seeing in photos of actual Australian vehicles. I’m pretty happy with the colors that I came up with. This entry was posted in US / NATO Micro Armor and tagged Abrams, Austrailia, Camo, M1, M1A1 AIM SA, Paint by Allen. Bookmark the permalink. 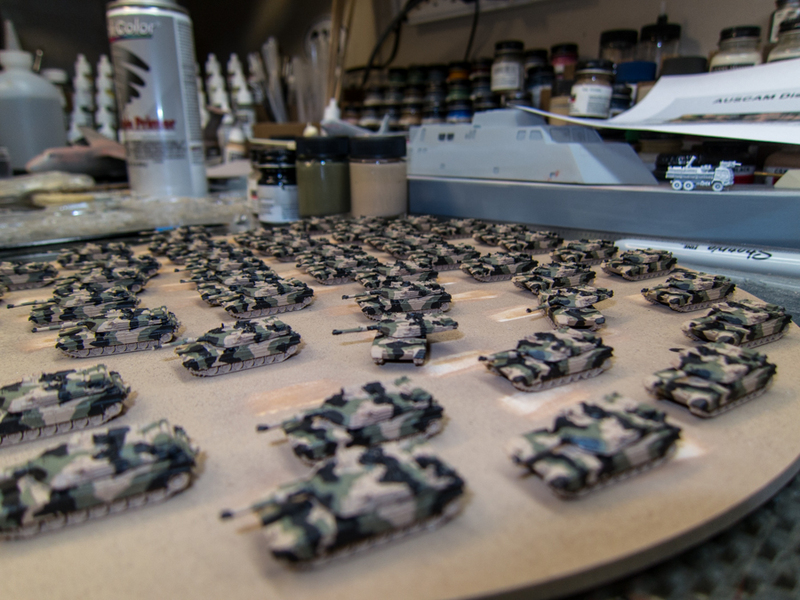 Allen, the colors that I used for Australians is: spray Testors Olive Drab, then hand paint Dark Tan by Testors, then Testors Black. I used M1A1 by GHQ.